Why the Name Walnut Ledge? Pictured above is our infamous walnut tree that gave the farm its name and is the 5th largest English Walnut in the state. In 2007 it was recorded at 53' in height. 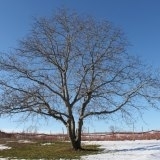 Also on the property are 12 Chinese and Italian Chestnut trees. Our Chinese varieties have also hit the record books coming in at 4th, 6th and 11th largest in the state. In 2007 the largest of these trees topped off at 42' in height. 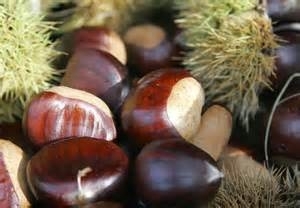 Nuts come into season late summer through mid-autumn. While very difficult to compete with the squirrels in the harvest the walnuts, the chestnuts are an easier find as they are protected by their spiny burrs. After we harvest these, we have them for sale at our location on order or Saturdays when available.